Bold can be a compliment. "Oh, I love that rug. It's so bold and bright." It can also be an insult. "Look at that rug. It's so bold and bright. Ugh." I suspect that folks looking at this card are going to fall into one those two camps. However, Bold was always bad when hurled by your 6th grade nun/teacher. The Beatles had arrived, and wearing long hair and bangs was IN. While I knew I would never be part of the cool kids clique, I, didn't want to be mocked for having short bangs, particularly since my mother cut my hair and did so with no skill, but utmost confidence. So I took a risk and let my bangs grow out beyond the top of my eyebrows, which was the line we couldn't cross. The rest of the country was on fire protesting civil rights. I was protesting bangs. Sure enough, Mother St. Joseph** called me to the front of the class. "You are being bold. Go home and cut those bangs or don't come back." From that moment on, I kept my bangs at exactly the line of demarcation even if they were crooked at times. I'd see Mother St. Joseph checking out my bangs and I would sit up a little straighter and almost dare her to challenge them. I still love bold colors and design. For this card, I used various images from Texture Two by Flora and Fauna and Distress Oxide inks to make a bold background. The Distress Oxide inks have great coverage, but dry chalky and matte. I may stamp this with a true dye ink and compare the results. The original version of this card had a fair amount of white and it was distracting and hard to focus (kind of like when your bangs are to long...) on the sentiment. So I used a pale pink (Worn Lipstick) ink and filled in some of the white spaces after the die was already adhered, and that helped focus the eye on the sentiment. The thanks die is from Memory Box. MOOD WHEN DONE: I'm good! Hope you have a good week. ** Our nuns were called "Mother Saint .. " rather than "Sister .. ."
Loved the story about your bangs. My mom actually went to beauty school- Madame Sedonia's School of Cosmetology! She couldn't cut my bangs worth squat. She would be going well but when just about finished she would go wonky and have to start again. I went all through school with one inch bangs!!! 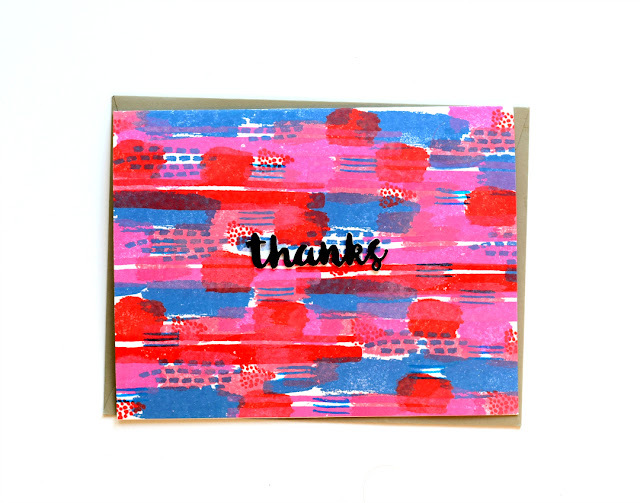 Fabulously BOLD card (in the best way) and I loved your story. I am a fan of the bold colors. Always have been. I love bold! Card is fabulous and you are, too! Definitely Bold. My favorite colors pink, red and blue. I suspect you still have a rebel streak. I CAS'ed your Party Animals card for 3 middle school girls who shoveled my driveway during the recent snow. They live down the street and did not asked for money. The card did contain money. I like how you know just which stamps are for you, and I like bold colors! Interesting about the pink, but I can see how less contrast would be less distracting behind the sentiment. To my eyes, this card is bold and bright in a very good, creative way. Your Catholic school stories take me far, far beyond my world. Remember Toni home perms? Right. Those could be a disaster. Ask me how I know. OMG my mother cut my bangs also. I swear they would be 1/2" long by the time she got them "even". It was the worst! She gave me home perms also. Why did she hate me so? And those nuns scared the crap out of me. « ... no skill, but utmost confidence. » Those few words just made my day, LOL. And your awesome bold card sings out to me.